Many longbowmen sign a contract of indenture with a captain to become part of his retinue or company. The captain then hires out their services to the king. 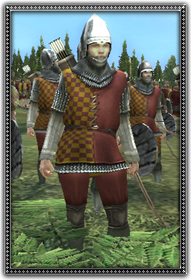 Such men are in effect professional soldiers, and highly skilled archers. They're well armoured and equipped and confident in their own abilities.